Back in the nineteen sixties, synthesisers were a brand new product. Up until that point, pretty much the only way to make sounds using oscillators was to buy military surplus equipment. Bob Moog made one of the first synthesisers actually designed from the point of view of a musician by listening to the feedback of his friends and customers. One of those friends and customers was Wendy Carlos. Wendy Carlos was well known, back then at least, for introducing the general public to the synthesiser with her album Switched-On Bach, in which she played a sprawling Moog modular synthesiser, which to the layman still resembled a telephone switchboard more than a musical instrument. Less well known was her involvement with improving Moog's synthesiser. She nudged his efforts in the right direction, convincing him to build a vocoder which enabled her to add electronic sounding vocals to her music, and to build a velocity sensitive keyboard for his synthesiser, allowing her to play it more expressively. The vocoder Moog built for her was most famously used in her performance of Beethoven's Ninth Symphony, which appeared in the soundtrack to Stanley Kubrick's adaptation of A Clockwork Orange. It would be neglectful to focus on Carlos's performances of other composers' work, and even her suggestions to Moog, when her own music is so breathtakingly original. Performed primarily on synthesisers, Wendy Carlos's music is firmly in the classical and experimental arena. Despite her continual embracement of new technology, a stark contrast to those techno producers who are currently fetishising old analogue synthesisers, it would be hard to pin down any of her work to a specific era. She's practically alone in using modern technology to create pieces of music that split off from classical music in a completely different direction to pop music and even ambient music. As a result, Carlos has not just a whole genre but pretty much a whole culture to herself, her music representing an era that never was, the branch that music could have taken but didn't because everyone else using synthesisers was too busy pairing them with drum machines (to make techno) or electric guitars and acoustic drums (to make prog rock). The biological equivalent of Carlos's original music might be a species that has a whole phylum to itself. Isao Tomita has followed in her footsteps, but doesn't appear to have released any original compositions, apparently contenting himself with performing the work of others. Perhaps her closest kin, then, is Delia Derbyshire or Ursula Bogner, although the compositions of all three are markedly different from each other — which is just as it should be given the limitless potential of their instruments of choice. Perhaps the real question is not why so few people followed Carlos, but why so many people followed Juan Atkins, Derrick May and Kevin Saunderson rather than all carving radically different niches of their own. It still annoys me to think that people accused Carlos of cheating — pushing the mythical big, red button on her synthesiser that practically composed and played the music for her. She used these tools to craft her art well before they were tamed enough for mere mortals to touch them. 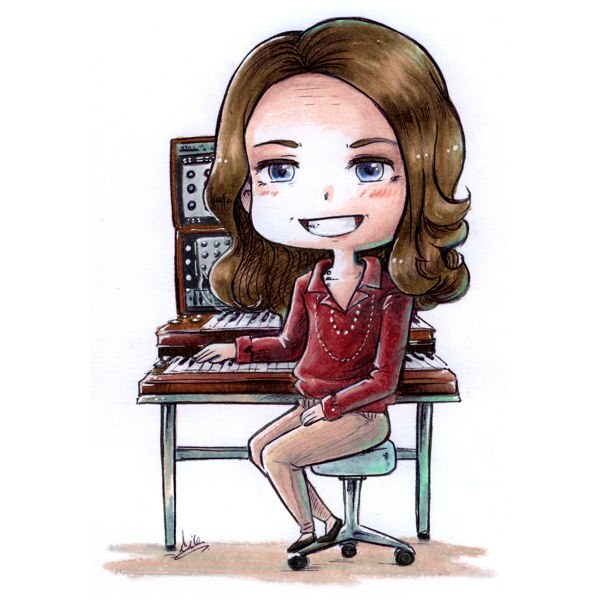 Her first main musical instrument, the Moog modular, was strictly monophonic, meaning it could only play one note at a time. As if that wasn't difficult enough, it would also drift out of tune very quickly. She spent countless hours painstakingly splicing audiotape together with sticky tape, and many more switching dials and patching in cables until she'd articulated to her machine exactly how to make a previously impossible new sound she'd dreamed up, such as a percussive instrument with vibrato. She may be too experimental for my personal taste, going so far as to embrace different tuning systems, but whatever your preference, you have to acknowledge that she's clearly devoted to her work and puts in the kind of dedication that few other musicians in any genre can claim. Listening to her music humbles me, making me realise just how comparatively lazy I am. I can't be the only one, as listening to pretty much any other modern music shows how shallow it is in comparison to her deeply layered and textured pieces. So although I may not always appreciate her work because it's so far out there, I certainly respect the woman who composed and performed it, painstakingly slaving over complex machines until the dead of night in the name of art. If only popular entertainers put in the same amount of effort, then we might have something accessible and deep.